We were recently invited to the openings of two new schools in Liverpool – Newpark Primary and Northway Primary both of which have had a 4D immersive space designed into the new builds. 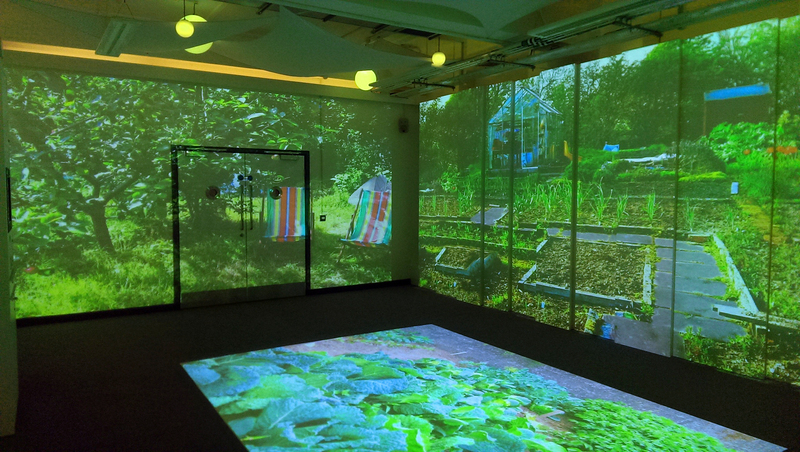 Lauren from our team went to have a look around the new schools and to speak with some of the teachers who have been using immersive approaches to learning in really creative ways. 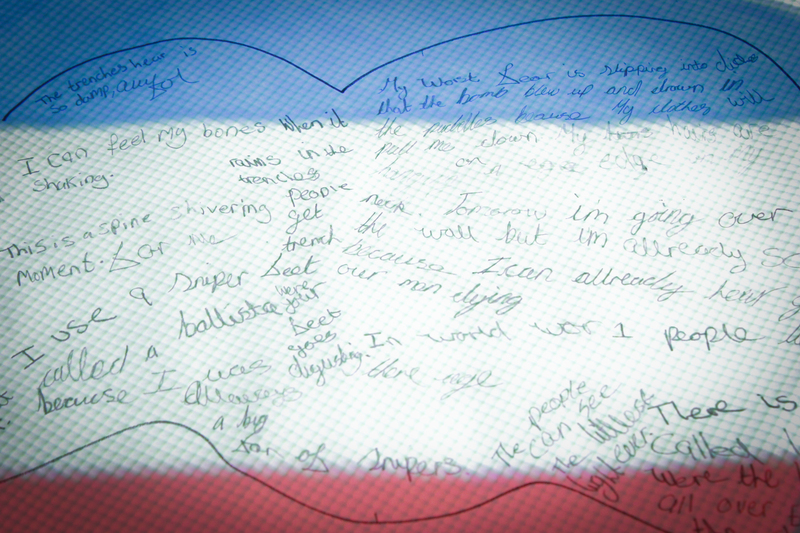 What’s great about lessons in a 4D space, where there are no tables and chairs, no boundaries to learning – collaborative work feels more accessible and pupils who may not ordinarily express their thoughts and ideas, start to uncover them and share with others more openly. Teachers often tell us that there is a marked improvement in written work and recall of information back in the classroom after being fully immersed in a topic inside a 4D space. 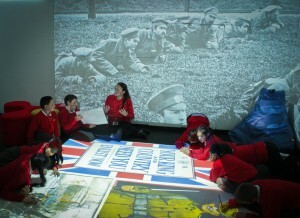 I got talking to the teacher Ian Willis, who said that he had already loved using the space for a number of activities and topics since its installation. I discussed possible ways of extending the lessons by bringing objects and materials into the class; suggesting the use of material to project the ocean scenes onto while pupils lay beneath, giving the effect of being underwater. Or that right then and there, he could even take the projections off and plunge the class into darkness to simply be immersed in the sounds of gun fire and bombs. 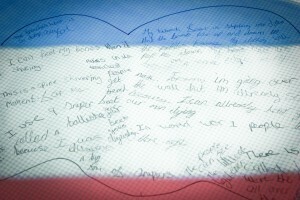 He loved the idea, so for the final 5 minutes of the lesson, this is what he did, asking Year 6 to just imagine how it might feel to be in the trenches and not being able to see in front of you. When the lights came back on the looks on these 9 and 10 year olds just showed how effective this was. Lessons like this become memorable due to them involving all of the senses, immersing the class to create tangible feelings and empathic responses but within the safety of the school environment. 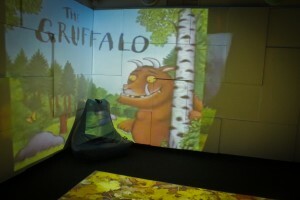 As you can see, New Park are really using their space to great effect by adding their own content and creating their own lessons based on children’s literature – ‘The Gruffalo’, the ‘Tiger Who Came to Tea’ and ‘Charlie and the Chocolate Factory’. The 4D software really comes into its own when you begin to add your own content so you can really customise your experiences and take ownership of your topics. 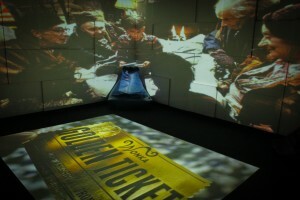 Location – taking the pupils to all the locations of the children in the book who find a Golden Ticket. This led onto the question of ‘What sweets would you buy in the sweet shop in the book?’ Asking the class to think about the amount things might cost, weigh and quantities of things. And from that she discussed ‘Where does chocolate come from?’ – going right back to the source of the cocoa beans in Africa to teach the class about fair trade – which in turn changed the pupil’s answers to the original questions of money and choices! On entering the school I was greeted by pupils throughout the corridor – ‘Welcome to Northway’, ‘Welcome to our new school’, ‘Thank you for coming!’ leading all the way to the school hall which was filled with parents, governors, former pupils, the Mayor, the building firm Morgan Sindall and many other people who had helped create the new school and the community around it. Head teacher, Mr Anderson, spoke about how he felt that the community around Northway had been really supportive and summed it up with expressing that the whole process had been. ‘Flexible, Fun and Fantastic!’ also noting how they’d worked closely with New Park Primary to share and develop the ideas for each school, which having been to both was really evident. It was a joy to see how a larger community was being formed by the two individual schools connecting together and sharing the process with not only school staff and parents – but the wider area too. 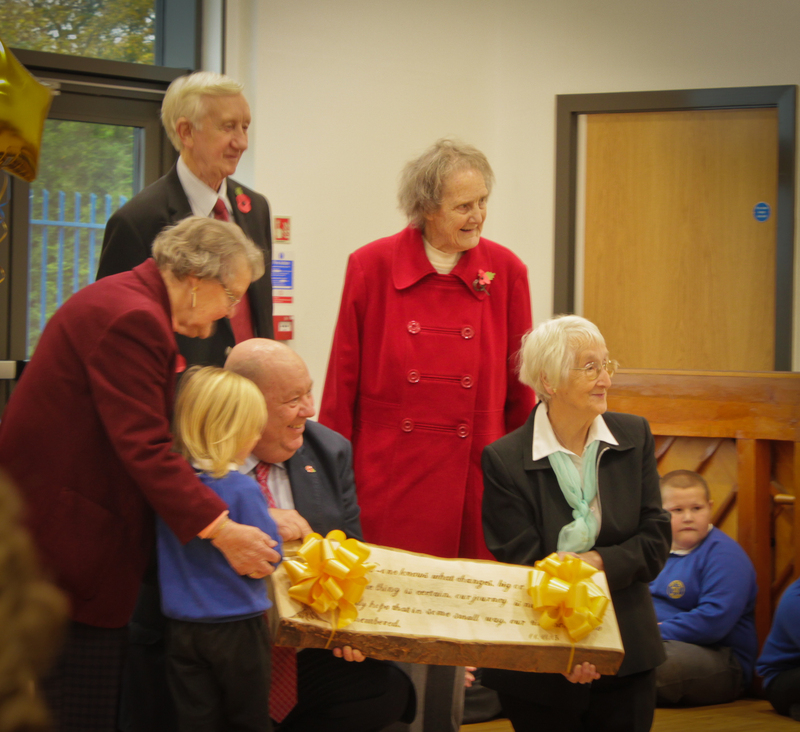 A wooden plaque was presented by the youngest pupil, James, (4 and 8 months) and the oldest former pupil, Dorothy (82) and her family, to officially open the school. We were then invited outside to watch the placement of a time capsule containing letters and items from the school to be opened in 2025! Hannah from Year 3 told me all about how she’s used the room to set up a market: bringing in items, money, weighing scales and setting up tills to immerse the pupils in a bespoke maths lesson. 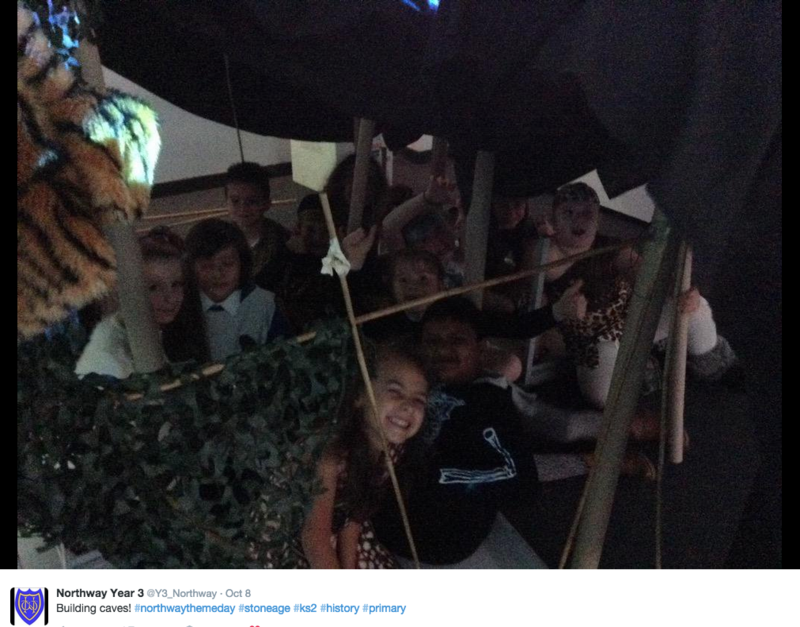 Year 3 had also used 4D Cave to explore the stone age. 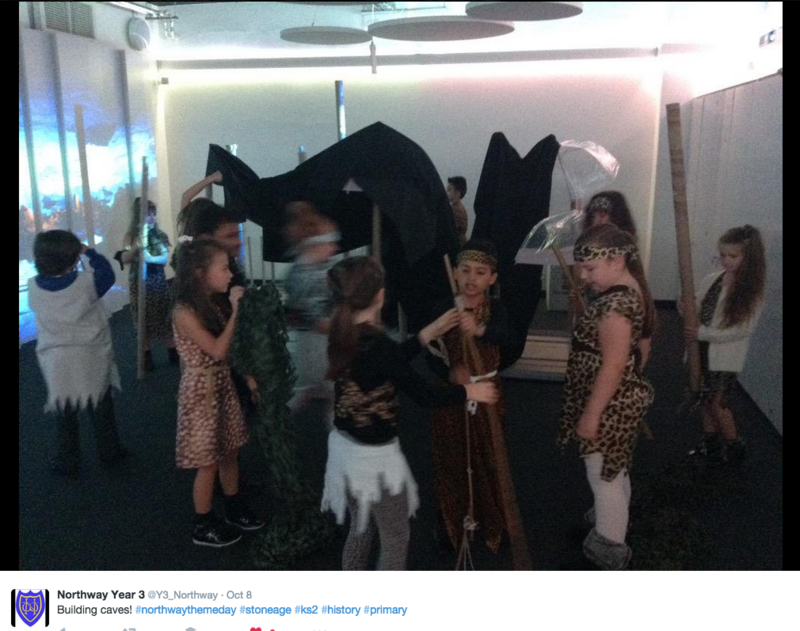 The whole class had got dressed up as stone age people, lined up outside the room before heading in to draw cave paintings using paper on the floor. 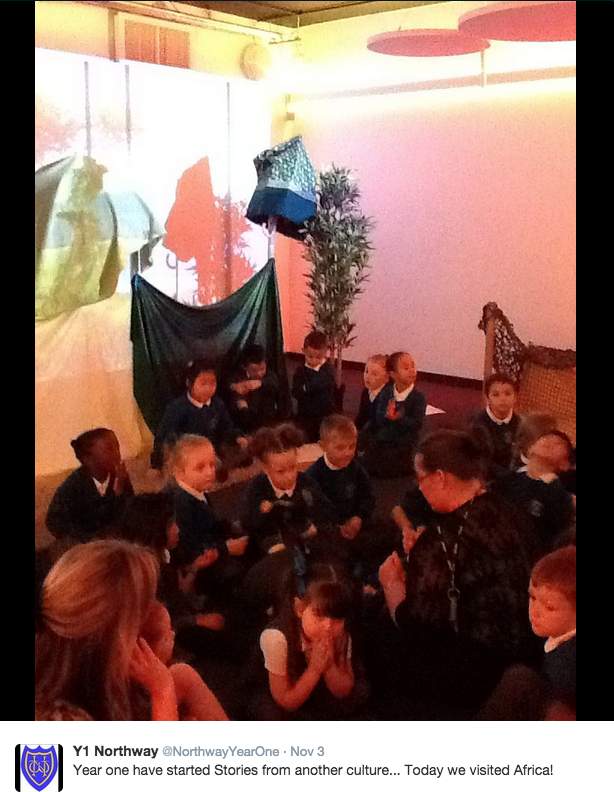 Year 1 had actually created full sized trees to add to the space to create a 3D forest within the 4D Forest theme and by the looks of things have also recently travelling to Africa for their new topic! 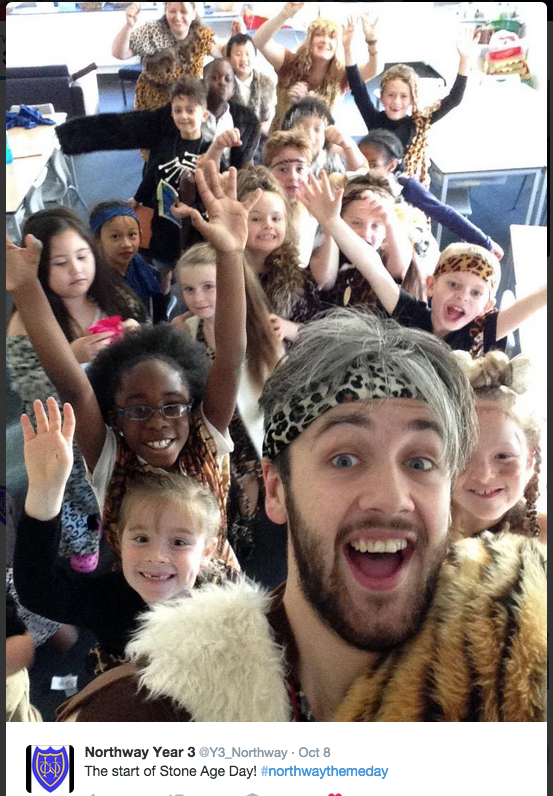 Thank you to everyone from New Park and Northway Primary Schools for inviting us to their open days, we had a blast! 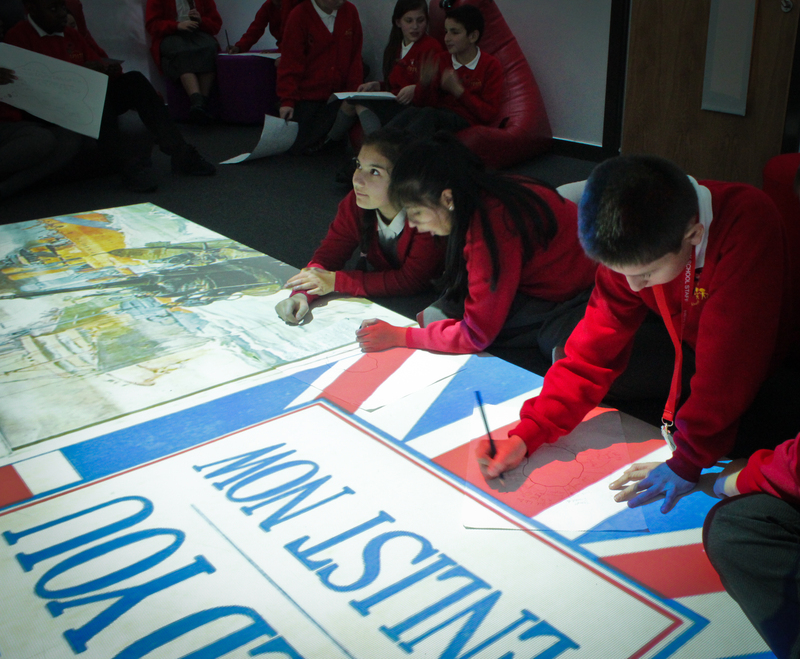 It’s been great to see New Park and Northway putting the tools of projection, light and sound to create really beautiful and creative lessons to engage their pupils in immersive learning journeys. Through using their spaces frequently the learning experiences created go beyond the four walls of a normal classroom allowing the pupils to be transported back in time or to another place in the world creating memorable lessons for future reference. At the end of September we travelled down to London to facilitate our first ever South East 4D exchange at East Croydon School. We welcomed teachers from East Croydon, Thomas Day and Thomas Knyvett, thank you for all those who attended and to East Croydon for hosting. Once everyone was refreshed with tea and biscuits the exchange got underway. See our Prezi below for a roundup of all the ideas and some tips and tricks from us too! Don’t forget, you can exchange ideas with the 4D network by using the hashtag #4dexchange – we will always retweet and celebrate your immersive approaches on our social media streams. 4D exchange is our regular networking event where practitioners come to share new lesson ideas, immersive content and best practice. 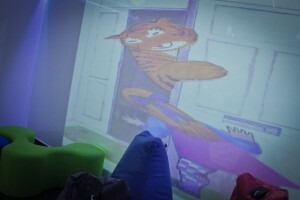 Our April event was held in Liverpool and we had an enthusiastic and passionate group of staff join us to explain how immersive learning has impacted a huge variety of lessons. From WW1 to Mr Tumble, we explored lots of ideas and also discussed how staff roles can play a huge impact in implementing immersive learning. 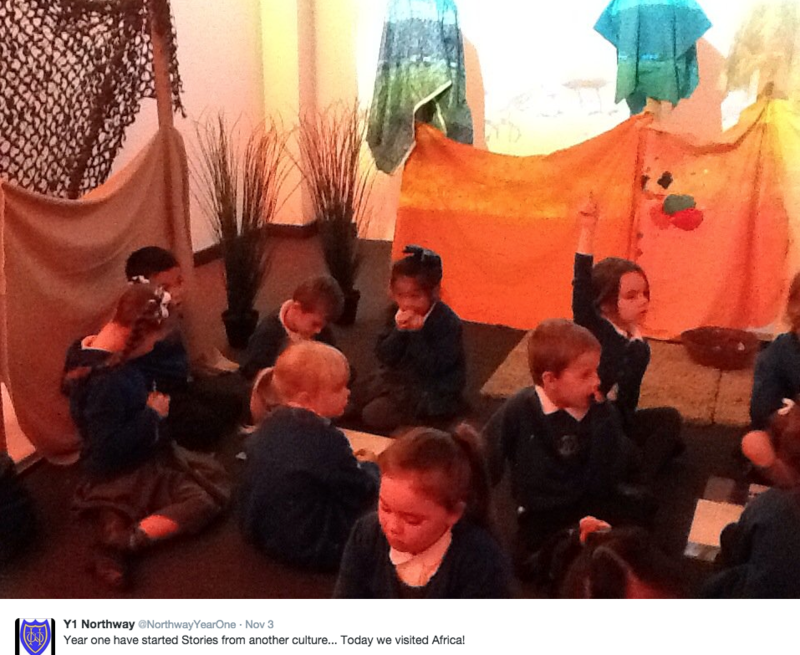 Finally we looked at how to carry on these engaging experiences when back in a traditional classroom. Many thanks to all those who attended and Kensington Primary for being our host for the afternoon. Our next 4D exchange will be announced very soon. If you’re a London based practitioner, you’ll want to keep checking back and also keep the end of June free in your diary! 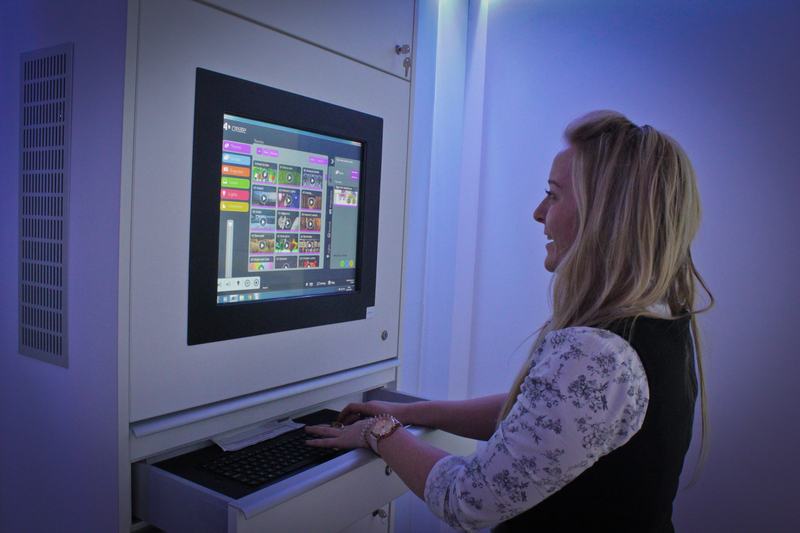 If you’d like to host a 4D exchange or find out more about our range of training programmes, get in touch with the 4D team here. 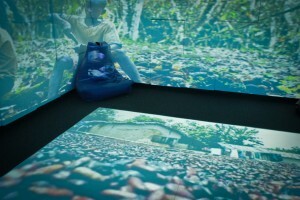 This April come and explore the 4D immersive space at Lime Hub in Liverpool. The recently renovated centre is a health and well-being hub for up to 150 people with learning and physical disabilities. 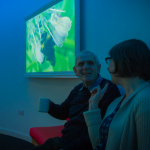 The immersive environment is used for therapy sessions for people with additional needs as well as the wider community including those living with dementia. The flexibility of the space ensures each immersive experience can be tailor made for each individual to provide a truly person centred approach. 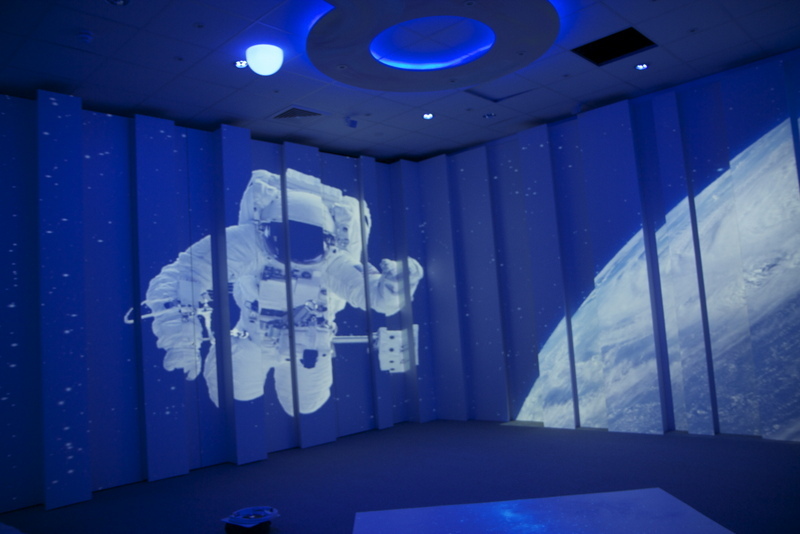 Our open afternoon is a chance to see the immersive space, the wider hub and also meet the 4D creative team to hear how we create immersive experiences for all ages and abilities. Learn more about Lime Hub at this Guardian link and then register to attend below. Dementia Champions in your school. At 4D we are always looking for new ways to support and understand the wider communities that we work with. 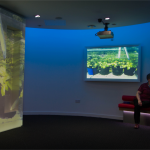 Although our main focus has been within education for many years, in the last 18 months we’ve been working closely with Mersey Care NHS Trust creating immersive spaces for people living with dementia. The spaces are being used to encourage communication, inspire memories and create a sense of well being through person centred immersive experiences. So, with that in mind 4D Group are developing ways of bringing the two worlds of education and healthcare together as part of an intergenerational project. After the whole 4D team were trained to be Dementia Friends at the end of 2014, our training coordinator Inés and content developer Lauren went one step further to become Dementia Champions. The aim being for both to be able to spread the word even further to our schools and help develop dementia friendly communities. If you’d like us to come to your school to run an immersive dementia friends event, please get in touch. The events are free and will give your pupils information on people living with dementia as approved by The Alzheimer’s Society. Just get in touch here and we can make a plan. The day was split into two sections – the first, a general introduction to Dementia Friends with a Dementia Friends Information Session given by Becky, the course leader. The second part of the day was focussed on presentation skills, planning and what it means to be a Dementia Champion. When we arrived we were within a group of about 30 people, people from all different walks of life and different reasons for attending the session. It was really interesting to hear why people wanted to become Dementia Champions. The group ranged from a neuroscientist who has studied dementia for years to an African support worker who wanted to dispel myths within the African community that dementia doesn’t even exist and also included nurses working closely with people living with dementia, as well as individuals who have been affected by dementia on a personal level. Throughout the sessions, which last only about an hour, you participate, are asked questions and most of all, you have fun! Overall though, you come out with a much better understanding of people who are living with dementia and people who are caring for those people. The next session looked at the Dementia Friends Workshop in more detail and allowed us to ask questions. We were pleased to find that The Alzheimer’s Society have created resources especially for young people and a variety of different exercises to help make the concepts easier to grasp. Becky also confirmed that the sessions have worked really well in schools with pupils really gaining knowledge, understanding and readily becoming Dementia Friends. The second half of the day looked at presentation skills and how to arrange your own sessions. It’s all well and good knowing the workshop but if you can’t inspire and engage people, the information is not going to be shared. Lots of practice and feedback later, I’m very pleased to confirm we passed and are now officially Dementia Champions ready and able to deliver this wonderful information to the public, businesses, your school staff or your pupils! If you’re interested in finding out more about Dementia Friends or our Intergenerational project for schools or if you’d like to have a Dementia Friends Information Session in your school delivered by Inés or Lauren please get in touch. Last week our team visited Belfast to share our immersive approaches to dementia care at the Dementia Festival Of Ideas. We took part in an Ideas Lab which aimed to highlight and join together forward thinking companies who are generating new approaches for people living with dementia. It was great to see the expanse of work being carried out with people living with dementia by artists and creative practitioners from across the world, and to understand how practices adapted to whether those people were within a care or community setting. We particularly loved the idea of creating semi-public gallery spaces within care homes to help develop dementia friendly communities, a project by Florence-based Architect Virginia Serrani. 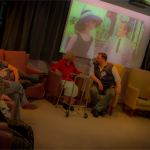 What was most inspiring was people’s commitment to developing creative experiences that were made with people living with dementia, rather than presented to them, a testament to the ways in which creative practice can empower people to regain ownership of their life. 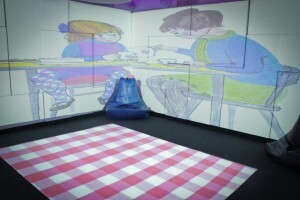 At 4D we have been working with MerseyCare NHS trust to create person centred immersive spaces to improve communication and inspire memories. To find out more, explore this presentation below which we shared with the panel of experts at the Festival Of Ideas. 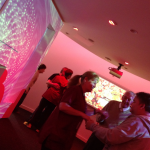 If you’d like to visit an immersive space, please just get in touch with the 4D team who will be happy to help.